crystal forming robots is a robotic system that makes the process of crystal growth tangible. The background of this work are the early experiments of Gordon Pask on building a chemical computer as a learning system. With the help of software simulation the idea of a growing structure that modifies its own perception of the environment is illustrated. The robotic implementation of the growth process is a first step towards making such a process tangible. The crystal forming robots are a physical simulation of a growth process, similar to the growth of crystal structures. 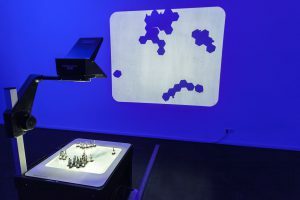 Each robot operates autonomously and is driven by the light of the overhead projector. When a robot has collected enough energy it is all released at once through a small motor and the robot will make a random movement. crystal forming robots on overhead, first version with rectangular shapes. The robots are equipped with tiny magnets, so that when they come close while they are moving, they attract each other. 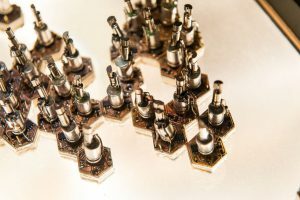 Over time a crystal like structure emerges from more and more little robots forming larger clusters. 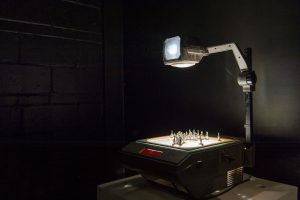 Through the overhead projector this process is magnified and an abstract movie of the real physical robots is projected to the wall. The background of this project is research on systems of growth, self organization and plastic change. The core idea to use robots to make the process of growth tangible and to develop an experimental system to study growth and the self-building of networks. For example changing the shape of the robots from rectangular to a hexagonal introduces a local change of geometric configuration that affect the global shape of the emerging structure. The most recent prototypes also make electrical contact when they cluster together. It will thus be possible to grow an electrical connection over time. When this electrical connection is used to modify the growth process itself it will also become possible to examine processes as they where described by Gordon Pask in his work on chemical computers. Crystal forming robots on overhead were on display at this years sight and sound festival in montreal, canada and also featured within the biennale internationale d’art numerique (bian).